August 27,1964, Thursday. Saw Howard with a girl. Stayed all night with Pearl. Couldn’t sleep. Just kept thinking how great it was walking into Denny’s with a boy and ignoring Howard. He kept looking as us but, I didn’t talk to him.. The girl he was with sure looked old! Like his sister. Pearl and I got up about 1:30 and got dressed about 4:00. We drove to Toes and got a Coke, than Howard drove by with that girl! He didn’t see me. Funny, but she wasn’t sitting next to him. 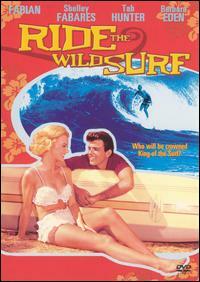 Tonight Pearl, Sandy and I went to the show and saw, “Ride the Wild Surf.” So GREAT!! But, I felt myself getting sick. After the show, these weird boys followed us all over, even to Sandy’s. We couldn’t loose them and they were ugly. It’s ridiculous how phony the Surfing scenes look in this movie. Ride the Wild Surf is romantic drama in the beach party style. It was filmed in 1963 and distributed in 1964. Unlike most films in the genre, it is known for its exceptional big wave surf footage – a common sight in surf movies of the time, but a rarity in beach party films. Likewise, the film has only one pop song – the titular Jan and Dean track, which is heard once, at the end of the film. This entry was posted in 1960's Surf Culture, 1964 High School Diary, Chick Secrets, diary, Little Sisters, Maybelline Girl, memoir, REALITY BLOG, Southern California 1964, teenage reality blog and tagged 1964, 1964 film, 57 Chevy, Beach, Culver City, Culver High School, dating, film Ride the Wild Surf, Jan and Dean, Maybelline, Maybelline Story, Playa del Rey Los Angeles, Saffrons Rule, Sharrie Williams, Southern California, Surfer's Rule, Toes in Playa Del Rey, West Side Surfers, Westchester High School. Bookmark the permalink.